My Mom and I were fawning over Anthropologie’s current swimwear line while chatting on the phone last night and we couldn’t believe how this retro style has come full circle. 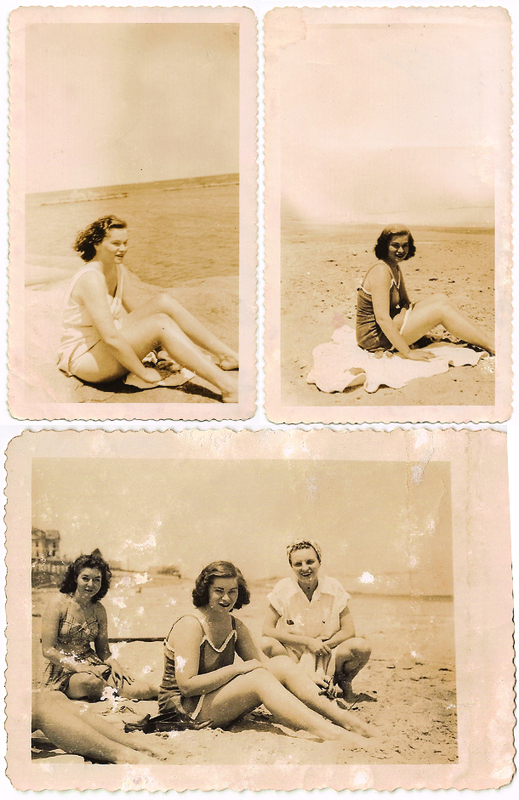 My Mom immediately recalled images of my grandmother when she was younger lounging on the beach with friends in these exact styles. So, of course I requested that she scan in the pics and send them to me immediately! OH MY GOSH! How incredible are these photos? That’s my gorgeous Nana pictured in the top two images and then pictured centered in the bottom image. Ahhh-mazing! They were taken in June of 1943. She was twenty years old and a Junior at Regis College. I have about a thousand questions that I wish I could ask her now! Who would have thought that I’d be wearing the exact same styles that my grandmother did? Oh fashion, this is why I love you. And, I must take after my Nana because I LOVE that little white retro swimsuit! Love the pictures. you've inspired me to start scanning family photos again this weekend.